A survey by Training magazine and Wilson Learning finds that while there is a strong desire to be more strategic, for the most part, L&D organizations and leaders are not doing what is needed to be recognized as strategic leaders. As professionals in Learning and Development (L&D), we have a tremendous impact on our organization’s success. We also believe we can contribute more, and more effectively, if we are more involved in organizational strategy and have “a seat at the table.” But are we, as professionals, doing the things we need to do to earn a seat at the table? And once there, are we contributing value that is having an impact on the organization’s success? These are the key questions posed in this industry survey of 544 L&D professionals, conducted by Training magazine in cooperation with Wilson Learning Worldwide. The results of this survey suggest that while there is a strong desire to be more strategic—and many organizations have achieved a level of strategic involvement—for the most part, L&D organizations and leaders are not doing what is needed to be recognized as strategic leaders. 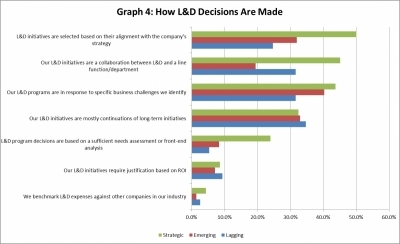 In addition, this research points to specific actions “Strategic L&D organizations” are taking that separate them from other organizations and provide a pathway to achieving a strategic L&D capability. How Well Is L&D Achieving Its Objectives? Best-in-class employees: These employees are in high demand, with other companies trying to recruit them. No talent gaps: There are no significant gaps in important areas of expertise. Sufficient resources: The necessary human resources are provided to effectively conduct operations in all areas of the company. Learning as a source of competitive advantage: Senior executives acknowledge the importance of learning to the organization’s success. Consistent funding of learning: L&D is treated like other functions when it comes to funding and investment decisions. Graph 1 below shows the results of the outcome measures. The vast majority of respondents agree or strongly agree that they have top talent and that other organizations try to recruit their employees. A majority also agree that L&D is treated just like other functions and that investment in L&D is a source of competitive advantage. However, a majority also indicate that their company has significant gaps in certain areas of expertise and, overall, does not have sufficient talent in all areas of the company. Strategic: Organizations that received the highest scores across these five items, indicating they are achieving the highest-level strategic outcomes. Emerging: Organizations that received scores in the middle range, indicating they are making moves toward being more strategic but have not achieved full success. Lagging: Organizations that received the lowest scores, indicating they have not made much movement toward achieving strategic outcomes. By categorizing organizations in this way, we can ask the key question: What are the Strategic organizations doing that the Emerging or Lagging organizations are not? In other words, what are some of the actions you can take to better achieve strategic outcomes? A prime indicator of L&D’s place in the organization is how L&D leaders are involved in the formation of the organization’s strategy. Functions such as marketing, finance, and, more recently, technology, tend to be directly involved in the creation of strategy. We asked our survey respondents to indicate the role the L&D function plays in organizational strategy. The results are shown in Graph 2; the green bar represents results from the organizations identified as Strategic (scoring the highest on the outcomes), while the red and blue bars show the results for the Emerging and Lagging organizations. Overall, only a small proportion (9 percent) indicate that L&D is directly involved from the beginning of organizational strategy formation. 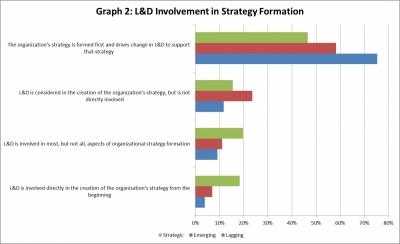 Strategic organizations, however, are more than twice as likely (18 percent) than Lagging organizations (4 percent) to directly involve L&D in strategy formation. For both Lagging and Emerging organizations, the majority (75 percent and 58 percent, respectively) indicate that L&D is only involved after the formation of strategy and is focused on ways to support strategy implementation. Thus, it appears that a key step in being strategic is to be directly involved in the formation of strategy, not just reacting to strategy. However, L&D leaders cannot just decide to be directly involved in strategy formation. There are steps that, over time, earn L&D leaders the right and role of trusted advisor, which eventually results in more involvement in strategy. So what are the steps Strategic L&D organizations are taking that differentiate them from Lagging and Emerging organizations? To answer this question, we asked respondents to rate the involvement of the head of L&D in various actions involved in strategic operations. 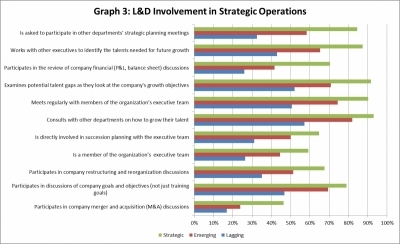 As shown in Graph 3, the results indicate that L&D organizations, in general, play a more passive role in strategic operations (consulting with departments, meeting with executives to help them execute their strategic plans, identifying talent gaps, etc.). Less than half of the respondents indicate that L&D participates directly in strategic discussions (such as mergers and acquisitions) and is part of the executive team in reviewing financial performance or restructuring discussions. However, this is less true for Strategic L&D organizations. As the graph shows, more than 50 percent of Strategic L&D organizations take an active role in all operational actions, with the exception of M&A decisions. The largest gaps between Strategic and Lagging organizations are in L&D involvement in departmental strategy development, identification of talent needs, and review of the organization’s financial status. Another key indicator of L&D strategic involvement is how learning and development investment decisions are made. 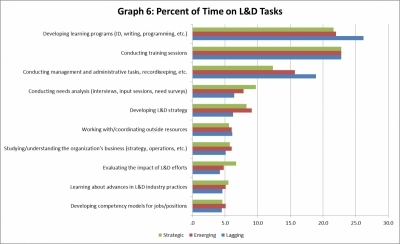 Graph 4 highlights two critical differences between Strategic L&D organizations and Lagging organizations. A higher proportion of Strategic L&D organizations make decisions based on the company’s strategy and in collaboration with a line function than do Lagging organizations. There is also a large difference in the use of needs analysis in L&D decisions, with more than four times as many Strategic organizations as Lagging or Emerging organizations using needs assessment in their investment decisions. It is more than simply strategic involvement that differentiates Strategic L&D organizations from Emerging and Lagging organizations. In addition to more support and involvement from top organizational executives for Strategic L&D organizations, there are also actions the L&D function itself can take to become more strategic. Lagging and Emerging organizations spend significantly more time on administrative tasks than Strategic organizations. Strategic organizations spend signihcantly more time conducting impact evaluations than both Lagging and Emerging organizations. Strategic organizations spend signihcantly more time conducting needs assessments than Lagging organizations. Both Emerging and Strategic organizations spend more time developing L&D strategy than Lagging organizations. The vast majority of all organizations use a wide variety of learning methods. In the survey, we asked participants to indicate whether they use a particular learning method and, if so, to rate the overall effectiveness of the method. 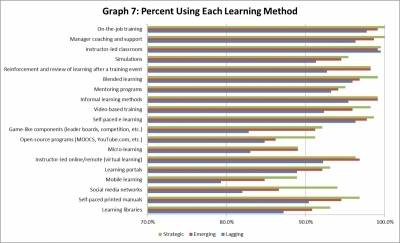 More than 80 percent of organizations use all the learning methods surveyed. However, there are interesting differences in the methods used by Strategic, Emerging, and Lagging organizations. Overall, Strategic organizations use a wider variety of learning methods than Emerging and Lagging organizations. As Graph 7 shows, Strategic organizations make greater use of mobile learning and blended learning than Lagging and Emerging organizations do. In addition, we unexpectedly found that Strategic organizations also make greater use of learning methods that tend to be low cost or free. For example, Strategic organizations make greater use of social media networks and open-source content than do either Lagging or Emerging organizations, despite the fact that both can be accessed with almost no cost. Independent of the use of different learning methods, we also examined the effectiveness of the learning methods used. The majority of participants rate most of the learning methods they use as effective or highly effective; however, the exceptions are interesting. Methods that the majority rate as ineffective are open-source programs (such as Massive Open Online Courses or MOOCs), learning portals, social media networks, learning libraries, and self-paced printed manuals. Thus, some of the elements with the greatest investment (learning portals, learning libraries) are the least effective, as are some of the methods requiring the least investment (MOOCs and social media networks). There are few differences between the Strategic, Emerging, and Lagging organizations on their ratings of effectiveness. Graph 8 shows the rank order of effectiveness ratings. All three groups tend to rate the same methods as highly effective and less effective. Study company financials: Finance tends to be the language organizations use to describe strategic actions, so understanding how to read and interpret financial statements is critical to becoming a Strategic L&D leader. The initial focus should be on profit-and-loss statements and balance sheets. Also, reading the company’s 10-K report (if you work in a publicly traded company) or annual report will further educate you on the company’s strategic initiatives. 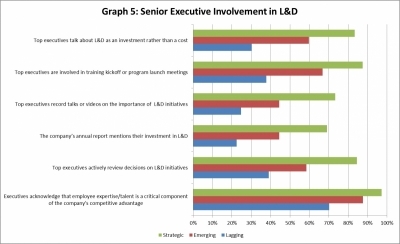 Expend more energy on L&D strategy: To be more strategic, you must have an L&D strategy. Find ways to reduce the amount of time spent on administrative tasks (through automation, for example) and devote that time to developing your L&D strategy. Describe the strategy link: For every L&D initiative, make sure you can describe the importance of that initiative as it relates to achieving important organizational strategies or critical success factors. Collaborate with line managers: In developing L&D strategy, collaborate with leaders of line functions. Focus on how the line function needs to address organizational strategy and how L&D supports that strategy. Conduct needs analysis: Make the front-end needs analysis process part of every new learning and development initiative. While each needs analysis does not need to be extensive, it should be sufficient to demonstrate the link to strategy and identify the organizational outcomes that will be affected. Conduct frequent training impact evaluations: Focus energies on results and return on investment measures as they have more relevance to senior executives. Use a broad range of information resources: While industry magazines and associations are the primary sources for L&D trends, Strategic L&D organizations also examine research from scholarly journals, vendor-based studies, books by industry leaders, and other resources. These best practices of Strategic L&D organizations can help you make a more strategic contribution to your organization. Determine how you currently are positioned strategically by assessing your own L&D organization against these best practices and identify where you fit, as well as the key actions you can take to move your organization forward. While putting these plans into action will not guarantee you a seat at the table, if you don’t act, a seat may never become available. In September and October 2015, Training magazine and Wilson Learning Worldwide conducted a survey of L&D professionals. A total of 544 professionals responded to the survey. All were employees of companies that create and use learning and development services with their own employees; external providers of learning and development services were excluded from the results. The responses were a well-balanced representation of professionals and decision-makers within the Learning and Development industry. The majority of respondents (58 percent) had management responsibility, with the largest groups having the title of manager (29 percent) or director (23 percent). Trainers (12 percent) and instructional designers/developers (9 percent) constituted the majority of non-management respondents. Half of the respondents (50.4 percent) were from companies that only operate in the United States; the other half were composed of global (34.2 percent) and multinational (15.4 percent) companies. Organizations were fairly evenly distributed in terms of company size, ranging from less than 100 employees to more than 50,000, with the largest group (21.4 percent) having 1,000 to 5,000 employees. Although individual organizations spent an average of $2.3 million annually on learning and development, this was spread fairly evenly across all spending categories; the largest spending category group (15.7 percent) spent $50,000 or less. Webinar: Insights from Training Magazine's Strategic L&D Best Practice Survey: We Talk the Talk, But Do We Walk the Walk? Join us for this live Webinar to hear first hand from the researcher Michael Leimbach, Ph.D., on the survey results. Michael Leimbach, Ph.D., is vice president of Global Research and Development for Wilson Learning Worldwide. With more than 30 years in the field, Dr. Leimbach provides leadership for researching and designing Wilson Learning’s diagnostic, learning, and performance improvement capabilities. Dr. Leimbach also developed Wilson Learning’s Impact Evaluation capability and return on investment models. He has coauthored four books, is the editor-in-chief for the ADHR professional journal, and serves in a leadership role for the ISO technical committee TC232: Standards for Learning Service Providers. For more information, contact Wilson Learning at 800.328.7937 or visit WilsonLearning.com.